The Creator Of Which Iconic Comic Book Character Also Helped Create The Lie Detector? The Original 4th Of July Celebratory Colors Were Not Red, White, And Blue, But? William Moulton Marston was quite the renaissance man. A Harvard-trained psychologist, he was also an inventor and writer. While many people, especially in the comic book community, remember him most for his creation of Wonder Woman in the 1940s, one of his lesser-known contributions was an invention that would serve as the foundation for modern lie detectors. 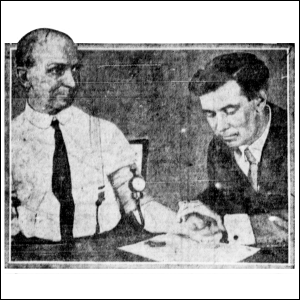 In addition to his accomplishments within the field of psychology and as a comic book writer, Marston studied the use of systolic blood pressure as a component of lie detection analysis. After hearing his wife talking about how her blood pressure went up when she got mad or excited, he began exploring the idea of using blood pressure to analyze emotional states and ultimately used it to study physiological responses to deceptive speech. John Augustus Larson would go on to use Marston’s systolic blood pressure meter as a component in what would become the modern multi-approach lie detector he invented. Marston’s research would make an appearance in his later comic book writing. Much like a band around the chest of his subjects revealed whether or not they were lying, Wonder Woman’s Lasso of Truth also bound up suspects and helped her to uncover their deceptions.